This was my first mode of transportation when I was 15. My brother and I found it at a garage sale and I believe I paid $70 for it. I wanted to offer less but my brother got mad and told me to just pay what he was asking. I think it ran when we got it... but not well which meant I was destined to have it. This was to be my first ground up restoration. The entire moped was completely disassembled. The frame was stripped to the metal and painted by "the guys at the paint shop" at Empire Airlines with the red paint that occurred on the middle strip on the airplanes. The completed moped was done by the next spring and was driven for a year before being deemed to slow. 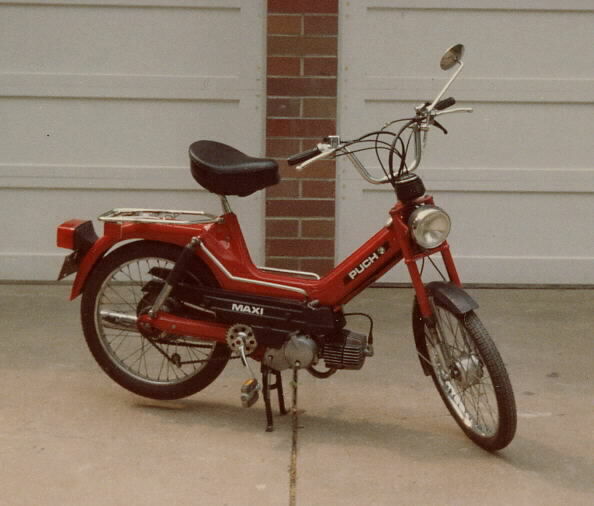 Second restoration occurred after spending the summer in Holland finding out that they sold Black Market parts for the Puch which would "dramatically speed up" the slow reliable moped. After clocking the moped at over 50 mph.... I felt it was done. The moped ended up being stolen from my back yard while I lived in Charlotte NC. It was a very sad day that I lost the "funky moped".